The island is geared towards diving tourists more than backpackers on a budget and offers both basic through luxury accommodation. There are hardly any currents and a wide selection of dive sites and dive shops, schools and resorts. Ko Tao is a small island of approximately 21 km² and receives over a 100,000 visitors per year. To minimize your impact on the eco-system, notice that there are no garbage disposal facilities, so everything that can't be burned has to be taken away. Try to avoid plastic bags and straws that are given out for every purchase you make. There is also no department to clean the roads or other public areas, so don't dump your waste on the open landscape. Water is scarce and electricity expensive, so don't waste them. 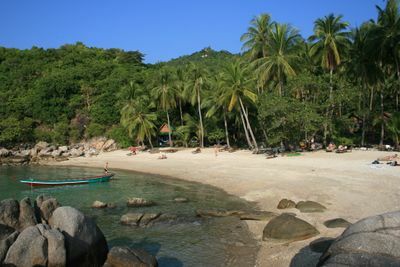 Peak seasons in Ko Tao are from December to March and July to August. July/August is actually high season due to Northern Hemisphere summer and rain dominating most of the rest of the country. The Gulf of Thailand is on a separate weather system and is usually sunny, however regional instability - such as Typhoons in the South China Sea can provide daily bouts of rain. Monsoon is in Nov-Jan and can be constant rain for days at a time. It is a quite popular destination among Thais also, so it can be nearly fully booked on Thai holidays. The nearest airports are in Chumphon Airport (Nok Air), Pathio District, Chumphon and Ko Samui Airport. Both offer onward high speed ferry connections to Koh Tao. This option is one of the fastest to get to Koh Tao and generally much less expensive than via Samui Airport. Nok Air  operate two daily flights between Don Mueang Airport (DMK), Bangkok and Chumphon Airport, Pathio with van transfer for the 55 minute ride to the ferry terminal. Nok Air and AirAsia sell an integrated Fly 'an' Ferry combi ticket from Bangkok to Ko Tao via Chumphon Airport directly on their website; this combines flight, transfer and high speed ferry in a single ticket. Services at the Chumphon Airport  The airport has transit agents for onward travel to Chumphon and the islands including Koh Tao, Koh Phangan, Ko Nang Yuan and Koh Samui. Fame Tours and Services have a counter at arrivals hall offering transfer and hotel services. This is the best option for transfers as the airport doesn't have a meter taxi service. Lomprayah has a counter offering transfers and tickets for high speed catamarans. The TAT Tourism Authority of Thailand, Chumphon has a tourism information counter offering information on the region adjacent to the airline counters. Lomprayah will move the main ferry terminal and pier to a new purpose built facility at Cape Pathiu about 2 km from the Chumphon Airport in Pathiu, the pier will open Q3 2016. This will reduce travel time from the airport to pier by 50 minutes and cut 90 minutes from the bus journey from Bangkok to the ferry pier. Samui is fairly well connected to major cities in the region such as Bangkok, Penang and Singapore. Thai Airways, Bangkok Airways and Silkair operate from the private airport in Ko Samui and both charge artificially high rates. Bangkok Airways operates more daily flights to and from Ko Samui than Thai Airways. There is a 300 baht departure tax for all flights. Other Airports Several airlines, including Thai Air Asia, Nok Air and Thai Airways operate from the Surat Thani Airport. The closest departure point for the island ferry service is Chumphon. Numerous agents sell tickets for a variety of boats and speeds travelling. The fastest Lomprayah High Speed Catamaran takes about 90 minutes, the slowest night boat almost 5 hours. Lomprayah have a pickup service from your hotel to the pier for 100 baht. The ticket itself is 600 baht wherever you book it. Both Lomprayah and Songserm sell packages from Bangkok by bus or Nok Air  offer a fly / sea combi ticket. The late night ferries are normally vehicle or cargo ferries, making for a slower (5-6 hour trip, arriving at 05:00) and offer a comfortable bunk bed in a dormitory included in the 300 baht ticket. If you are arriving via bus or train, be sure to arrive well before the ferry times, as the ferry terminal is around 1 hour travel time from the train station, and a missed connection either results in a late night trip on the vehicle/cargo ferry or an overnight stay and a 05:30 start to catch the bus to the ferry terminal for the first ferry the next day. A good option for travelling from Bangkok is to book Sleeper Train #85; leaving Bangkok around 19:30 and arriving in Chumphon at 04:00 (usally late 1-2h) and then have a ticket booked for the 07:00 ferry. Most ferry operators can pick you up from the station where you can while away the 3 hour connection gap. You can also buy your ferry ticket at the station when you get off the train at 04:00. Lomprayah have an inclusive ticket from Bangkok on a comfortable large bus included in the price with connections to the port. If you're coming from the south, you can take a ferry from Don Sak pier, 60km from Surat Thani on the mainland with a travel time of around 3 hours for the morning ferry, or from Ko Samui, 1.5 hours, or Ko Pha Ngan 1 hour. If you're taking a boat from Surat Thani, one possibility might be an overnight ferry. These depart around 23:00 and arrive in the morning, about 06:00 (subject to changes). It's advisable to arrive early to grab a mattress as most of the boats are former cargo boats and so the passenger facilities are basic. You can also day trip on diving charters from Ko Samui. Many have high speed boats that can make the trip to Ko Tao in about 1 hour. Lomprayah High Speed Catamaran  or Seatran  are the fastest and most comfortable way to get to Ko Tao. They run twice a day from Ko Samui, Ko Pha Ngan, Surat Thani, and Chumphon. They also have online booking - useful for checking availability at peak times and all their boats have air conditioning and movies for passengers. Booking from Ko Samui can cost 500-1000 baht on the streets. You can get a ticket for the slower boat (2.5 hours) as low as 250 baht if you buy it in the ticket office next to the pier (next to 7 eleven). You can get a ticket on the spot, no need to book in advance. There is no car rental in Ko Tao. Your only options are motorbike/ATV rental, or boat taxi hire. Main roads are fine and made of flat plain concrete. If you know how to drive a motorcycle and feel safe with it, you will not have a problem along the main roads. If you want to drive a bit out (or up) the roads can get pretty steep. You should yourself prepare of that, or park your bike at the side and walk up. Nevertheless most of the steep roads are also paved with concrete. Nevertheless, if you drive away from the main roads, you will encounter dirt roads. Skill is required. Don't over estimate yourself. But again, it's fine. There is one main road running north to south on the island with many smaller roads diverting off it. Some roads lead over the spine of small mountains that run along the middle of the island and are mostly concrete. Nevertheless, the more remote you go the more the roads become simple dirt roads. If you are looking for an adventure, the dirt roads are a good place to find it, also be aware as distances can be quite deceiving due to the quality and elevation changes of the trail. Be aware when filling up any vehicle with gas (petrol or gasoline to non Americans). Attendents will often distract you (particularly in pairs) and try to draw your attention away from either the fact that the pump has already been used and not refreshed, thus charging you for both transactions; or they will quickly refresh the pump used for your vehicle and point to an adjacent pumps higher reading. This is particularly the case at the gas station up the hill from the pier in Mae Haad, whilst you may need fuel immediately the next station is less than 1km away in Sairee. Due to the intimidating nature of the three or more men working at the Mae Haad station, as anywhere in the region it would be advisable to buy gas from the minutely-inflated roadside stalls dotted across the island, gas is pre-measured in whiskey bottles. There are usually plenty of taxi cars available on both Sairee village and Mae Haad, however they tend to be expensive given the distances travelled. The best way to travel is by renting a small scooter or motorcycle, and this gives you the freedom to explore all of the treasures of the island without paying the large taxi costs. Taxi drivers have begun carrying around a small piece of laminated paper with the 'official' minimum prices for journeys, whilst the official prices state no journey can be less than 300 baht they will dip to 200 baht (100 per person). Whilst the majority of people will stay within 1 kilometre of the pier these prices are extortionate. It is cheaper to rent a scooter for 24 hours and transport your luggage yourself. You can rent bicycles and motorcycles at a lot of places on Sairee Beach, Mae Haad, and Chalok. Prices range between 150-250 THB/day. If you are two people or one heavy (70kg) one and want to go up hill, pick a 125cc machine or if you know how to handle it a 110cc semi-automatic. Most motorcycle will be a Honda Click. It is normal practice for motorcycle rental places to ask for a passport as deposit, this is due to the fear of drunken tourists crashing their bike and not returning it. You should be wary of handing over your passport unless you are positive of the legitimacy of the operation. Most shops also take a deposit of 2000 THB and some ID or a copy of your passport. As everywhere people will try to scam you, or charging a bit amount for small scratches. However, renters reacted on this and offer small-scratch-is-no-scratch policy or insurances. Always (!) make sure you note down and photograph all scratches and dents before you rent a bike from anyone. A good option is to hire a bike from your bungalow/resort. Just keep your normal mistrust on and look at the bikes. If the look brand new, maybe avoid them. Below you will find a list of motorcycle renters that are fine. Longtail boats offer rides to and from certain beaches on the island. They are a more comfortable way of getting to isolated beaches than attempting to ride over the mountains, however they are noisy. Round island longtail can be as much as 2,000 baht, whereas some short trips will only be 100-200 baht. Take a bike around the island. Shark Bay is a good place to go snorkelling for the day (don't worry too much about sharks, they are only small black-tip reef sharks). Ko Nang Yuan, Freedom beach, Laem Thian, Mango Bay, Hin Wong Bay and Tanote Bay are good day excursions, and are accessible by road or boat. Some roads, such as to Mango Bay, are more suited to dirt bikes or cars rather than scooters. Many rental scooters come equipped with off-road tyres, which help tremendously with navigating the crevasse riddled dirt trails. Mango Bay and Laem Thian are accessible by scooter but are challenging rides and suited to more experienced riders. However, to see the best places, go by foot as some are inaccessible to motorists. There are a number of good viewpoints around the island such as John Suwan Mountain Viewpoint in the south of the island, Two View in the centre, and Fraggle Rock in the north. All beaches in Thailand are public. Some property owners may try to give the incorrect impression that "their" beach is private. Freedive training and education worldwide is generally done through PADI , AIDA , SSI , Apnea Academy  and Apnea Total  freediving courses. Scuba diving is still the biggest attraction on Ko Tao. Diving in Ko Tao is easy, fun, and you can see turtles, stingrays, barracudas, lots of small fish, reef sharks and there is a very small chance of seeing a whale shark. At Chumphon Pinnacle you are likely to see juvenile bull sharks which have, until recently, been misidentified as grey reef sharks. Caution: the bulls are curious and very aggressive though for many years thousands of people have dived this site without a single shark-related incident. Nearly any time of the year except November is good diving weather in Ko Tao and visibility can exceed 40 m. Average visibility is around 15-20 m, which in November is reduced to 5 m and the seas are choppy. It is possible and perfectly comfortable to swim and dive without a wetsuit year round. However, as with most diving a wetsuit is recommended to help reduce risk of cuts or injury. Avoid contact with coral reefs. There are a huge number of dive operators on the island, many offer budget or even free accommodation, but this is not really true as you will usually get a discount if you stay elsewhere. In 2012 the price for PADI open water certification including the new PADI training manual, professional instruction, rental equipment, boat dives and certification was around 9,800 baht, and for SSI open water certification including, professional instruction, rental equipment, boat dives and certification around 9,000 baht; insurance and basic accommodation may also be included. Things to consider before taking your courses: 1. Class size - Smaller the class size means you will get more personal instruction. Scuba diving is not like swimming in a pool with goggles. A couple of deep dive points and a wreck and cave. Ask the shop how many divers are in the class. Big classes then the weakest diver will get the most attention. 2. Instructor Level - Not all instructors are the same, after doing multiple fun dives technique can clearly be an issue here with the dive masters and dive instructors. As a rule of thumb where the instructors have had their experience at usually rates them as how good of a diver they are. Ask instructors how many dives they have had, where they recieved their certifications, and years of experience. 3. Price - cheaper is not always better, try to check either on the internet or once on koh tao, the dive shop that is corresponding the best to you. Make sure teaching materials are up to date, equipment is in good condition, and people are talking the language you need properly, your first steps in diving are very important and it is a special time for you, so make sure you put all the chances on your side, and choose a dive center that fits you!! 4. Make sure the company has a Valid TAT license - this ensures that you are diving with a legitimate company and hence have coverage in case of an accident. 5. Make sure the company has their own equipment. There are many new shops that have opened on Koh Tao that do not have full time staff, do not own boats, and do not own any equipment. These shops generally have lower prices, but they cannot guarantee where you will be diving since they do not have the equipment - you may end up doing your whole course from the beach. Dive Instructor trainees looking for jobs here are tough as there is always applicants in waiting. A common method for teaching new divers is to train in a pool first by being taught about 20 basic skills before being taken out into the open water. Others will instead take you to a secluded beach so you will see fish and coral from the start and you might be able to squeeze in a short extra dive in this way, depending on your group and instructor. Some shops have a private pier, some shops depart with a longtail from the beach, and some use the public pier, where you will have to climb some other boats. Ask if this matters to you. Most important: find out the maximum number of dive students in a group, and make sure you get an instructor who speaks your language if you are not absolutely sure about your English. These are the little things that will make the difference between an OK course and a great one. Watch out for dive instructors who may offer you the Nitrox-course without telling you they charge extra for it. Asia Divers Resort, . In Sairee, a 5 min walk from the beach. Gold PADI Instructor Development Centre offers a full range variety of diving courses, from bubblemaker to staff instructor, including divemaster internships. Multiple languages are used for the courses and the resort's bar is always a nice place to chill out after diving. The Korean team here seems a little lax on safety requirements. Ban's Diving Resort, . In the centre of Sairee Beach. PADI open water courses up to professional PADI Instructor courses. A full range of technical diving courses are also available. They may have the largest diving center in all of Asia, with two pools and lots of classes and boasts the biggest boats and a very large resort that reaches Sairee Beach. Nice sleeping facilities and constantly expanding. Big Blue Diving Resort, . A SSI Diamond Instructor Training Center & a BSAC Center of Excellence, Big Blue has 2 fantastic beachfront locations directly on Sairee Beach. Both Resorts offer a beach side bar and restaurant & Big Blue 2 also has a large purpose built swimming pool for confined water skills. With over 100 rooms this dive center offers all courses from beginner to instructor with Asia's leading certifying Instructor Trainers Simon Garrity and Paul Tanner. Big Blue Tech is the technical arm of this outfit offerring all things technical, including cave trips to Khao Sok National Park & Wreck trips throughout Thailand, Malaysia & Singapore. Big Blue Conservation offers eco-internships and has for the last 3 years won PADI's Project Aware Environmental Achievement Award & been awarded SSI most environmentally friendly Dive center in Thailand. Big Blue Freediving is run by 2 record holding Instructors who are also Koh Tao's only recognised AIDA judges.One of the longest-established dive centres on Koh Tao, Big Blue is also one of Koh Tao's most popular. Big Bubble Dive Resort. Main street (also located in Chalok Baan Kao),. One of the longer established dive centres on Ko Tao. Relaxed, fun diving. Scuba diving lessons from beginner to PADI Divemaster training with well-trained, professional staff. Buddha View IDC Dive Resort, Chalok Ban Kao Beach, (south Ko Tao) . PADI 5 star IDC gold palm resort with friendly staff, good facilities and a BBQ and beach bar to relax in the evenings. Dive instructor courses and professional training programs with a divemaster. Lots of very serious divers here as with people taking high level courses. Good place to get certified with lots of staff available and dive instructors in training to help with easy courses. Great value to get your certifications. The resort itself could use a rehaul as warm showers is an option here with flushing toilets. Watch out for bad equipment. Coral Grand Divers & Resort, . PADI 5 Star IDC Resort. Located in a much quieter area than the other dive shops, at the far end of the beach. The hotel is more upmarket and better suited for families. Available courses from beginners all the way to professional. Operates 3 dive boats plus a speed boat. Free accommodation. Crystal Dive Resort, . PADI scuba diving resort. All PADI dive courses, diving internships, eco-diving and professional divemaster and instructor development courses. Free accommodation. Davy Jones Locker, ('next to Sairee Beach'), . Divemaster Internships and PADI Instructor Training, and MCA Boat Handling courses in their RIB. Accommodation and gear packages are available for all courses. Dive Point, . PADI dive shop run by an Austrian. Offering diving classes in German, French, Italian, and English. Small groups and individual care for the students special needs. Diving On Koh Tao, (http://www.divingonkohtao.com). All PADI Courses, From Open Water up to Professionnal level. Low-budget or deluxe accommodation, free nights with courses. Information about Ko Tao, how to get there and all about scuba diving. Easy Divers . PADI dive shop with friendly experienced instructors. Professional and fun with great accommodation, and the only dive centre on Ko Tao with all-inclusive packages. With a private pier and a maximum class size of 6 students to 1 instructor. Impian Divers is a 6star Dutch Instructor Training- and Dive Center, . Impian Divers is nicely located in old town Mae Haad. They place great value on individual support, by keeping the groups for diving limited by 4 divers per professional dive leader, and they conduct a diving course in 4 different languages. The school is European-owned/managed with high safety record/procedures, but is still easy going. They differ from most dive centers because included in their fair prices is a dive insurance and staff members have Thai working permits. They have their own boat and can therefore choose different locations daily, offer longer dive times and non-early morning departures. Impian Divers has 15 years of experience diving around Ko Tao. Island Dive Club, . In the centre of Sairee Beach. Does good deals on course and accommodation packages. The Thai staff can be annoying, so deal with the foreigners, they really make the effort. The dive shop is not that busy, meaning you might get an instructor for yourself or be taught in a small group. Jamahkiri Resort and Spa, . Right next to Sharks Bay, with practically private diving on a small capacity quick boat. Good for snorkeling, spa, and one of the best free dive scuba resorts. Usually small groups but comes at cost. Best gear on the island. Master Divers (Mae Haad) . A small professional dive centre located in Mae Haad. They guarantee small groups and offer private tuition and private guiding too. They have an experienced team and time their boat trips to go to dive sites when they are quietest..
New Way Diving, . * ☎ +66 456 528 ([email protected]), . 6.00-20.00. One of the oldest and most reputable dive shops. This small dive school has the first dive boat out in the morning. The car leaves for the harbour at 06:00 to avoid any crowds. Small groups of 4 divers maximum, friendly and professional instructors. This 5* PADI IDC Center offers beginner courses all the way up to Instructor level. In house ecological courses are available as well. Sairee Cottage Diving, . By far one of the best PADI Dive Centres on Koh Tao, small groups, extremely well trained dive professionals and located right in the middle of Sairee Beach. Scuba Junction, . Widely regarded as one of the best dive schools that's located right in the middle of Sairee Beach, A small shop with helpful, professional, and kind staff. Free accommodation with course. Max 4 people per group. Friendly atmosphere. Complimentary use of dive computers, compass and optical lens. Also has received one of the highest scores among all dive schools on TripAdvisor. Scuba Shack Koh Tao, . Amazing PADI dive center located directly at Sairee Beach. Scuba Shack Koh Tao provides all PADI courses and guarantees you the best diving and time of your life. Seashell Dive Centre, . Located in Sairee Beach, A small shop with helpful, professional, friendly and multilingual staff, free accommodation with course. Max 4 people per group (fun dive and course). One of the first boats in the morning. Simple Life Divers, . Popular medium-sized Western-owned and managed PADI dive centre on Ko Tao's Sairee Beach. Sunshine Divers Resort, Chalok Baan Kao, . PADI Gold Palm Resort. DMTs, staff, instructors, students, resident dogs and fun divers all contribute to the relaxed and friendly atmosphere. ACE Marine Expeditions  A professional family owned dive and tour operator. All dives and training are offered in small groups with a maximum of 2 divers per 1 staff or private tuition. Family and group tours are all welcome. Specializing in diving for photographers and film makers or those wishing to have a private diving experience. Diving and snorkel tours are offered on their exclusive speedboat or custom built dive boat and their dive schedules change daily to avoid the crowds. Dive Expeditions Head office is located in Sairee Beach, Koh Tao. Visit their booking office at The Gallery in Sairee Beach. All dive courses are offered from beginner to professional. ACE Marine Images  Established in 1996. An underwater film academy specializing in underwater photo and film training from beginner to professional. All training is offered in small groups or private tuition. Underwater Film Internships are available on request. ACE Film Studio is located in Sairee Beach, Koh Tao. Carabao Diving Center & resort  A good diving centre located at Chalok Baan Kao Bay, south Ko Tao. This is a quiet beach with some nice locations to eat and drink. The staff is very friendly and helpful. Good accommodation available. French Kiss Divers (Sairee Beach/Chalok Baan Khao) . A small professional dive centre located in Sairee Beach. French Kiss Divers is an SSI Instructor Training Center and propose Cross Over from most diving organizations to SSI instructor. Located in Sairee, their dive base is located in Chalok Baan Khao so they then can accommodate people that want to stay either in sairee beach or in the south of the island. They guarantee small groups and personal training, both in English and French language. Koh Tao Divers Koh Tao Divers, also known as KTD, is the oldest scuba diving school on Koh Tao, established in 1987. This SSI Diamond Instructor Training Center is known for our experienced instructors, relaxed vibe and amazing diving. At KTD you will find the full range of diving courses starting from beginner courses all the way to professional level and technical diving. Mojo Divers, . One of the fastest-growing SSI dive centers in Asia. Offers fun dives, intro diving, Sail Rock trips, and lessons in several languages. Has an office directly on Sairee Beach and one in the town on Moo 1, near the pub crawl meet-up location. New Heaven Dive School, . Over ten years of experience on Ko Tao. Has been involved with turtle conservation, reef restoration, the We Love Ko Tao festival, the Ko Tao Under Water Festival and any other activities which help to create the eco-friendly environment they would like to see on Ko Tao. Phoenix Divers  A well established professional dive centre located directly on South Sairee Beach. Dive courses start everyday through SSI and PADI and can be offered in many languages from beginner to professional. Phoenix is famous for their big, comfortable pink boat! The dive centre has some of the most experienced instructors on the island (all with over 10 years in the industry) and has an impeccable safety record. They are also a SSI Instructor Training Facility. Pura Vida Diving  Located in a quiet area on the resort road between Mae Haad and Sairee. 5 minutes walking from the pier. Spanish owned dive center. Small classes in many languages, professional diving, experienced and enthusiastic instructors, extensive choice of free accommodation with courses, private beach in front of the dive centre and a very welcoming atmosphere. Pura Vida offers SSI and padi courses. Roctopus Dive, . Located a short walk away from Sairee Beach, next to the Big Yellow hotel. Roctopus offers SSI, PADI, BSAC and reef conservation courses. Scuba Junction  The equipment is well maintained and they dive & teach strictly by the rulebook. Good accommodations nearby are available at the Prik Thai Bungalows and SBC Cabana. Scuba Junction is an SSI Diamond Instructor Training Facility. If you want to learn about coral reefs. Scubasail Offers a 30 m long sailing and diving yacht called the "Naga". Accommodation, diving courses, visiting pristine (dive) locations and a beautiful experience on board assisted by a helpful crew. Big Blue Tech, . Part of Big Blue Dive Resort, BBT offers TDI/SDI tech courses and BSAC courses from beginner to instructor. Calypso (Tanote Bay) . German dive teachers, small boat, small group, immediate dive of the beach. Wreck diving by the beach. CMAS certified. Quiet huts with lovely views next door at family Tanote Bay Resort. From 400 baht. Buddha View CDC Dive Resort, (Chalok Ban Kao Beach, south Ko Tao). PADI 5 star CDC gold palm resort with a great atmosphere, friendly staff, good facilities and an excellent BBQ and beach bar to relax in the evenings. Professional training programmes with dive master and dive instructor courses. Crystal Dive Career Development Center, . PADI student diver level course and are island specialists in PADI Divemaster and Instructor training. Maximum student-instructor ratio of 6:1, a wide selection of environmental programmes and courses. You do not need to be a certified diver/freediver to enjoy the underwater beauty around Koh Tao, you only need a snorkel mask to explore the undersea life. Snorkeling is easy and convenient – many sandy beaches offer easy access to the water, shallow, wind-protected bays make snorkeling safe. Please be aware that many beaches don't allow fins any more due to coral protection. Koh Tao means Turtle Island, if you are expecting seeing turtles, you are right! The island is important breeding ground for hawksbill and green turtles. Other famous sea creatures to see are Black Tip Reef Sharks (can be spotted on many beaches), lucky ones might meet whale sharks too! Detailed description on Snorkel Around The World site. Snorkeling trips around Koh Tao For those who spend only a few days on Koh Tao, but want to explore as many beaches as possible, it is recommended to join snorkel tours. The boats normally leave from Mae Haad pier and have 3-4 stops (depends on the weather/water conditions) around the island. Very comfortable, easy way to explore Koh Tao beaches and snorkel in the best bays! Over the last couple of years more and more non divers have discovered the beauty of this island with its secluded little bays and unspoiled mountain ridges. Due to this, and the increasing number of small upmarket resorts and villas nestled in the hillsides, there are nowadays a lot more activities available, including sailing, rock climbing ( Trad routes, Sport routes, Top rope routes and Bouldering), abseiling, cliff jumping, wake boarding, mini golf or bowling in Mae Haad, massage & yoga courses and cooking courses. ACE Marine Expeditions  An Exclusive expedition company specializing in day tours, snorkel trips, and diving for photographers and film makers or those wishing to have a more private experience. ACE offers day trips to Ang Thong Marine Park from Koh Tao, snorkel/explore expeditions around Koh Tao, Whaleshark Watch program, wedding and honeymoon packages, private charters, and exclusive speedboat trips. Charter and dive schedules change daily to avoid the crowds. 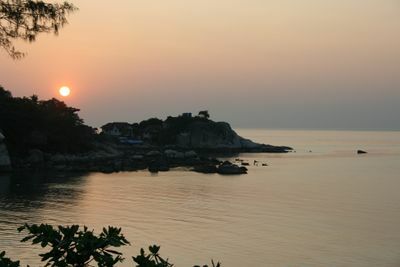 ACE Marine Expeditions Head office is located in Sairee Beach, Koh Tao. Black Tip Diving & Water Sports, . Wake boarding, tube rides, shark snorkelling trips, cliff jumping, round the island trips, hiking, kayaking. Bowling and mini golf, , (on the main road between Mae Haad and Chalok Baan Kao just after the turning for Aow Leuk). The bowling is "manual", there is a guy at the end of the alley that sets up your pins for you after each bowl and returns the ball to you. Cinema, . A full ac cinema which plays movies every Wednesday or can be rent per night. Has to be seen to be actually believed. Dive career internships, . Divemaster and dive instructor internship programmes, underwater videographer training and resort management courses with experienced PADI course directors. GAP year diving internships, . Specialises in training highly qualified and employable diving professionals, ranging from divemaster right up to instructor, over a duration of 2-7 months. Scuba Diving Internship and GAP year study, . High quality Dive Instructor Development training IDC on Koh Tao to achieve a successful career in Scuba Diving. Good Time Adventures, Diving, Beach Cafe and Bar , South Sairee Beach, ☎ +66 87 275 3604. Very small group Scuba Diving courses with flexible schedules. Dedicated speed boat taking divers diving. The only shop on Ko Tao with a weekly trip to Sail Rock. 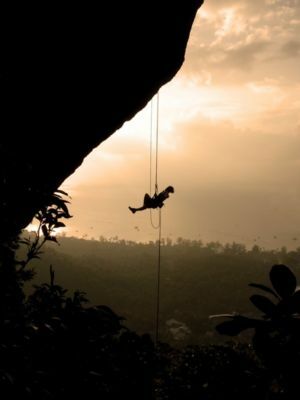 A wide range of adventure activities including: rock climbing instruction up to lead climbing and a guiding service, abseiling/rappelling, cliff jumping, snorkelling, wake boarding, boat cruises around Ko Tao and the New Island 2 Island zip line adventure. Bouldering equipment is also available and includes a free map of sites on the island. The Beach Cafe and Bar serves a tasty variety of Western, Thai and Burmese dishes on the beach. Doorstep sandwiches, healthy salads and wraps, big burgers and others. Weekly beer can chicken, ribs or fresh fish BBQ. Island Cruises, sailing charters. Day and sunset cruises, private charters, Ang Thong National Marine Park safaris and fully customized crewed charters. 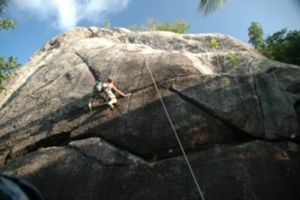 Koh Tao ProVideo, . A new and dynamic underwater videography company. Run by experienced underwater videographers and instructors who film and teach every day. Each course is tailor-made. Monsoon Gym and Muay Thai Camp, . For those looking for a serious workout. Muay Thai courses are provided and you can step in the ring for a real bout when you're ready. Mountain biking.' There is a shop renting mountain bikes next to the bowling and mini golf course. Mountain bikes are in reasonable condition and have suspension. 100 baht/day with a 1,000 baht deposit. Oceans Below-underwater video training, . 3 and 5 day courses in underwater videography and offers professional-level training for those looking to make a career of it. All training done with HD video cameras and quality Gates and Aquatica housings. Ocean Hiker sailing courses, . Seamanship courses and competent crew sailing courses, Ko Tao-based and liveaboard on ocean-going yacht. Ocean Sound Yoga, . An outstanding team providing Vinyasa, Yin, Hatha and Restorative yoga classes offered every day at 10AM and 6PM, 7 days per week. 300B per class or one week unlimited for 1000B. High quality Manduka equipment provided. All levels welcome. Pub Crawl Tel. +66 8 0690 5337. Enjoy drinks promos, prizes and join the crowd on a tour of the best bars on Ko Tao. Thailand gap internships, . 1-7 month internships in Pro HD video training, muay Thai, freediving, PADI instructor, dive master and technical dive courses. Dive4Photos, . Tel: +66 908 718734. Dive4Photos, Ko Tao’s only dedicated underwater photo facility. Workshops from beginner to advanced, covering macro & wide-angle, plus technique workshops for fluorescent photography & more. Photo editing workshops with lightroom. All camera equipment included. Shambala Yoga, . Yoga classes available every day fo the week from 10:00 to 12:00, and every day expect Sunday from 6:00 to 7:30. Drop-in classes cost 300 THB, and a 10 class pass is available for 2500 THB. Classes have students of varying levels, so variations on positions are always presented. Highly recommended. A huge selection of Thai food is available, including lots of seafood. Barbecued fish is one of the local favourites. As a large portion of the population are expats, you will find plenty of other cuisine as well. Prices range from 60 baht for stuff-on-rice through to 250 baht for a nice hunk of fresh barbecued fish at a decent restaurant. 30 baht would get you a fresh banana pancake, and 60 baht a bowl of porridge with honey at a budget resort restaurant. 200-300 baht would get you a bowl of freshly made Italian pasta, and 160-200 baht for pizza. Fresh fruit juices are available at many stalls for 30-40 baht. Dolce Vita Italian Restaurant, Mea Haad Square. Run by 2 brothers from Apulia (southeast Italy), this place offers traditional Italian cuisine in a cosy ambiance. Lavazza coffee, daily homemade pasta and authentic pizza, meats from New Zealand, fresh seafood, homemade desserts, wine bar. Open 16:00 until late. When you get a break from diving, there are a few bars on the island. The bars on the island rotate nights, so the best bet is to ask someone working at dive shop which bar will be crowded that night or check the posters. Many start off the evening at the bars located at the north end of Sairee, and after they close at 01:00, go onto whichever club is open for the rest of the evening at the south end of Sairee. Fishbowl, Located at Ban's Diving Resort next to BND and Leo bar on the Rocks. Live music and beer pong every night. DJL Bar, Pool & Restaurant, Sairee Village, (at Davey Jones Locker). Bar with swimming pool. Friday night pool parties, with free BBQ and shots. In Touch, Sairee Beach, (far south end of beach). Late-night club that is open only a couple of times a week. House music. Lotus Bar, north Sairee, (at the horizontal palm tree). Nightly fire show, sunset happy hour. Maya bar, Sairee Beach, (far south end of beach). Very similar to AC Bar, when one is open the other is closed, same music, same crowd right next door. You can usually find accommodation at the pier when you arrive. However, during peak times it is worth booking ahead unless you want to sleep on the beach or spend the night in one of the more expensive lodgings. If you are planning on taking a scuba diving course whilst on the island, most dive schools have an attached resort and will either discount the accommodation or throw it in for free when you book a course. During busy periods, most resorts with dive outfits will not want you to stay unless you are diving at least every second day with them. If you don't want to stay with your dive operator and use their free accommodation, you may want to ask for a discount. 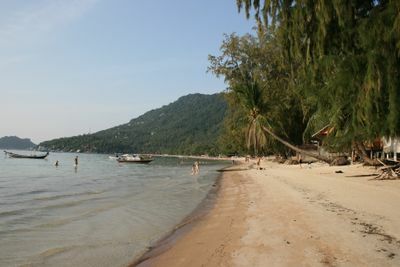 The majority of the accomodations on Ko Tao are centred around two main areas: Sairee Beach and Chalok Bay. This is the largest beach on Ko Tao, located on the west side of the island from the ferry terminal on the southwest corner of the island and running almost the length of the island. All along this beach you will find dive schools, resorts, restaurants, and bars. The southern and central sections of the beach are well-known for their night life, and the northern end has a large number of shops and restaurants which tends to be a bit quieter at night, but with the bars only a short walk down the "Yellow Brick Road". Chalok Baan Kao is a much more chilled, relaxed environment than Sairee Beach, while still giving access to a great range of restaurants, beach bars, and BBQs plus a wide range of accommodation from luxury resorts to budget rustic, beach-side bungalows. More populated than other east coast beaches, but this doesn't mean it's busy. There is no town or village here and only 4 resorts, each with an attached restaurant and one really tiny shop which is up the hill behind the resorts. There are no ATM machines. There are no really cheap places to eat as there are in Mae Haad. The sand on the beach is coarse and there is an unbelievable amount of broken glass in it. Likely because of people drinking while sitting on the rocks. Careful where you step and do your bit to pick up some of the glass. The shore is rocky and there is plenty of coral right off the beach. You can rent snorkelling equipment for 100 baht per day. There is a large rock just out to sea for those interested in cliff diving. There are regular trucks that go back and forth 3-4 times per day at 100 baht per person. Ask at your resort for taxi times. Alternatively you can charter your own truck for 400 baht minimum or 100 baht per person. This is the main spot of Koh Tao where any ferry will arrive at a pier. There are a lot of shops: Restaurants, 7-Eleven, Diving Shops, Travel Agents, Post Office, Banks, Motorbike Rentals and anything else you will need. The number one way to stay safe on Ko Tao is to not drink and drive. Motorbike accidents are very common, especially when driven under the influence, on the wrong side of the road, in the dark. All Terrain Vehicles (ATV) are becoming numerous on the island. They are considered a menace by many as they are expensive, slow, noisy, and more people injure themselves on them under the mistaken belief that they are safer. Walk or hire a smaller motorbike instead. Be aware that motorbike hire is cheap, but can become very expensive if you so much scratch the vehicle. Hire an older bike rather than a brand new one. Motorcycle Rental Be always careful when renting bikes and be honest to the motorcycle owner. Please be as honest and specify any damage to the rental bike at the return to the lender. A concealment of damage, and strain it even the smallest scratch, cause the next customer will be held liable. Not without reason is in most cases not to blame the rental shop that there is a problem at the return of the motorcycle, but unfortunately the previous guest who has made no indication of the damage. Therefore, you are always honest with each other, please: as a tenant for Bike Rental and as a motorcycle owner to tenant. Be fair to each other, it also works with a frictionless renting motorcycles. There are a high percentage of travelers who have never had any problems with the hiring and the return that shows us that a motorcycle rental is working very well. Please be fair to each other! Owen Bike which has several locations on Ko Tao such as one on Sairee Beach. You must give them a passport as a deposit, and even though you may take photos and return the bike in perfect condition, the lady will find small scratches and demand an exorbitant amount. Also avoid the overweight lady with a large mole on her nose who has a shop joining the petrol station in Sairee Beach (across from the 7-11). She runs the same scam, as sadly many other shops do. Koryan Shop on a road from the pier to the main road. They will rob thousands of baht for smallest scratch. The police does not help in such situations. They only suggest, that the only way to avoid the payment is to "lose" your passport and report it in Bangkok on a way home. There you will pay only 1000baht for a paper to get into plane. CJ Guesthouse & Supermarket 13/1 Moo 1, Had Sairee Beach, situated on the same street as New Way Divers. They will not issue receipts if you do not ask, and later demand that you have not paid the cumulative rental fee when you return the bike. Without a receipt, it will be frustrating and difficult to argue your case. Do not trust the husband-and-wife team. Sometimes bike rentals in the island claim a high amount for a unexisting scratch so be really carefull. They will all look like good guys but they will try to claim your money. Bing in the middle of Sairee beach seems to be trustworthy. If you do get in such trouble the Ko Tao the police are helpful. A friendly police officer named Chet who speaks very good English who might encourage you to file a report, saying that this happens several times a day on Ko Tao. If you don't file a report, the police can help you negotiate a better fine. There is only 6 police officers in an island who receives a lot of tourists per day, If you do file a report, contact your embassy and eventually the company will have to release your passport because it doesn't belong to you but to your government. INSIST on a receipt when you have paid the rental fee, or for every subsequent payment per rental day. Do not trust the shops to write accurate information in their own books. If you do not want to provide your passport as a deposit, some shops will ask for a amount as a one-off deposit instead. Again, take as many detailed photos as you can on the condition of the bikes. According to the Bangkok Hospital Samui in Koh Samui there are a lot of dengue cases coming in from Koh Tao. Always use mosquito repellent, even during daytime and under clothes, and use long sleeves and pants whenever possible. Favor air conditioned rooms and always use a mosquito net tucked in under the bed. Read up on how to avoid mosquito bites. Should you be unfortunate enough to need minor medical attention there are numerous clinics on the island. Since 2017 Koh Tao has it's own hospital. It's fully operating and running, however, for more serious injuries the closest hospitals are on Ko Samui or in Chumphon. Any medical condition not treatable locally will require a minimum of two hours ferry travel to reach a hospital. If the weather is bad, the physical rigours of such a trip can complicate medical treatment significantly. The local clinics can take blood samples and send them to Koh Samui for analysis. They will charge you for this even if you have a traveler's insurance, but you can insist on getting a receipt and get a refund from your insurance company. You can also insist on going to the hospital in Koh Samui in which case you should get your money back and the hospital will likely deal directly with your insurance company. 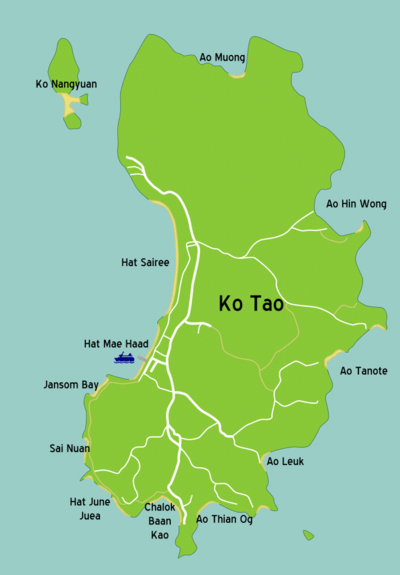 The entire island of Ko Tao has no sewage processing. Water contamination far exceeds Western standards at nearly all times. This includes both ocean waters and tap waters. Sewer water drains across the beach and even the roads in several areas and are easily encountered by unwitting tourists. Tap water supplied by shallow well pumps should be held suspect even during showering. Low-lying areas in Sairee and especially in Ban Chalok are the most polluted. The eastern areas far from the population centres are the cleanest. Be also aware of the safety of your hotel room. There are many reports of stolen money especially in the resorts on Sairee Beach. Normally the thieves, sometimes even hotel staff, sneak into the room while you are out diving and take your cash from your wallet or from your bags. Keep your valuables out of sight wherever you are. Openly displaying all your gadgets overtly is not a good idea. Tourists have been robbed after thieves have followed them to learn where the items are being kept. Stay away or avoid to buy a Thai Pancake at Sairee near Lotus, a guy name Abdul, they claim they are locals but they are not! Very sweet talker, trap mostly English girls while they drunk, steal and rude as well. Show rude sign and curse tourist as well. Watch out for the gas stations, they like to let the meter start at more than zero. The red gas station on the road that goes up to the turtle is known for this. Move on to the nearby islands of Ko Samui and Ko Pha Ngan or explore the untouched beaches and coastline of Pathio District nearby Chumphon Airport. Visit more then 40 beautiful islands in the Chumphon Archipelago including Ang Thong National Marine Park close to Ko Tao and then depart via Chumphon Airport. This page was last edited on 6 February 2019, at 04:55.